After a successful international tour the Spanish artist Lita Cabellut now presents her work for the first time on a grand scale in the Netherlands in The Noordbrabants Museum in ‘s-Hertogenbosch. The title of the exhibition, Trilogy of doubt, is derived from her latest trilogy. Five triptychs are being combined with a collection specially made for the Noordbrabants Museum entitled Strong Women: Coco Chanel, Frida Kahlo, Anne Frank, Mother Theresa, Madame Curie and Billie Holiday; female icons that symbolize exceptional ideals. 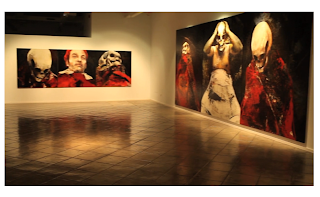 Trilogy of doubt and the other triptychs are socially inspired paintings about power, injustice and ignorance. The insightful characters act as a magnifying glass on life, on both its light and dark sides. They evoke associations with familiar types of art. Through her Spanish origin and her artistic career in the Netherlands, Cabellut feels as equally at home with Diego Velazquez and Francisco de Goya as with Hieronymus Bosch and Pieter Bruegel. Strong women is a gallery of the artist’s alter egos. Cabellut draws attention to characteristics such as bravery, compassion and sacrifice with these overwhelming figure pieces, their billboard-size format and striking self-developed technique. Her interest lies in the fragility of mankind. For her, art should be the way to the heart and to reason. Visit her site for fabulous work and a wonderful video which image above is from.